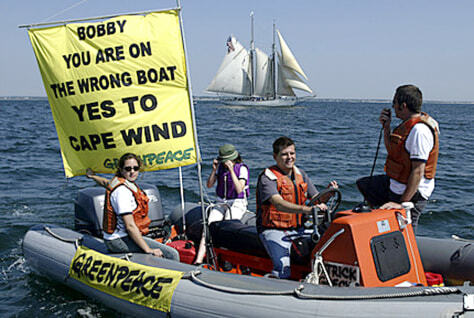 Greenpeace activists on Aug. 17, 2005, protested as Robert F. Kennedy, Jr., sailed behind them. Although an environmentalist, Kennedy opposes a wind farm proposed off Cape Cod. His family owns a compound that would have a view of the wind turbines.